TAITO Corporation“SPACE INVADERS®” appearing in Japan Expo 2016! “SPACE INVADERS®” appearing in world’s biggest Japan pop-culture event, Japan Expo 2016! Get the original SPACE INVADERS® folding fans only available at the event! TAITO Corporation (hereinafter referred to as TAITO), is working with Japan National Tourism Organization (hereinafter referred to as JNTO), to exhibit jointly at one of the world’s biggest events showcasing Japanese culture with a focus on pop-culture, “Japan Expo 2016”, from July 7th to 10th in Paris, France in an effort to promote the fascinating aspects of Japan. 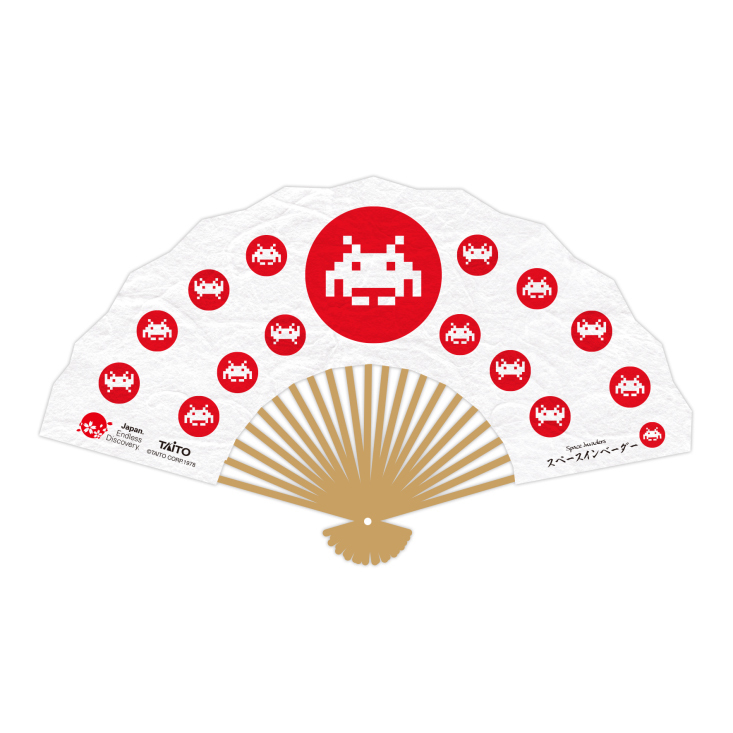 In line with the theme of fusing Japanese traditional culture and modern technology, we are giving away Japanese folding fans, a representative traditional craft, featuring an original “SPACE INVADERS®” design a s part of the free crane game trial campaign. We encourage everyone to visit the JNTO booth! Don’t miss the chance of getting the world-famous “SPACE INVADERS®” original folding fan only available at the event! Visitors may try the crane game for free once they have completed a stamp rally, where you collect stamps from each of the Japanese local government’s booths relating to tourism. Our staff will instruct visitors on how to win the prize, so don’t miss the opportunity to obtain this rare item! Planned, developed, and released by TAITO Corporation (TAITO), the 1978 arcade game SPACE INVADERS® became an instant global phenomenon. Today, its iconic characters frequently appear both in licensed projects worldwide and as TAITO’s corporate mascots. Chosen as an art collection at MOMA, and collaborating with famous fashion brands, SPACE INVADERS® is still loved all over the world today. TAITO is the exclusive owner of the global intellectual property rights, including copyrights and trademarks, for SPACE INVADERS® and its characters, and takes an active role regarding new SPACE INVADERS®-related enterprises. Japan National Tourism Organization (JNTO) was organized as a Japanese official tourism organization in 1964, and since then they have been trying to attract foreign tourists for 50 years. JNTO has overseas offices in 14 cities around the world, handling the promotion and marketing for inbound-tourism to Japan (foreign tourists travelling to Japan). * TAITO, the TAITO logo and SPACE INVADERS® are trademarks or registered trademarks of TAITO Corporation in Japan and other countries. All other trademarks are the property of the respective trademark owners. ©TAITO CORPORATION 1978 ALL RIGHTS RESERVED.